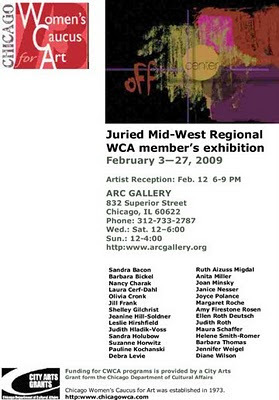 CWCA Juried Mid-West Region WCA Members' Exhibit "OFF CENTER"
Joan Minsky has some paintings and sketches on display and for sale at the Lakeview Art Supply Store, Lincoln and Melrose Avenues. Additional work by the artist are in the artwork for sale drawers. pigment print, 24 x 29.9 inches, courtesy of the artist. Please join The Renaissance Society for an opening reception for Anna Shteynshleyger, Sunday January 3, 2010, from 4:00 to 7:00pm. There will be a talk with the artist in Kent Hall room 120, from 5:00 to 6:00pm. Chicago-based artist Shteynshleyger belongs to a generation of photographers whose work is notable for its formal beauty and technical execution. Twenty-three works poignantly document Shteynshleyger's life over the past several years. During this period Shteynshleyger renegotiated her relationship to Orthodox Judaism, which she began to practice at the age of 16 after moving to the United States from Moscow where she was born. Too personal to qualify as documentary of the Orthodox Jewish community, Shteynshleyger's work spans a variety of genres -- portraits, still-life, landscape, and interiors. 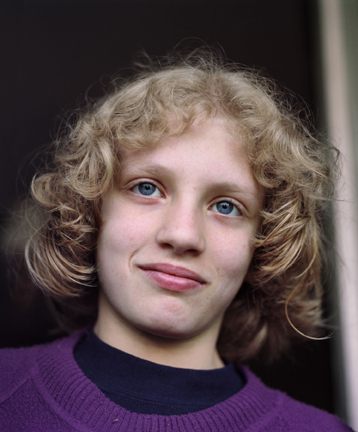 The images display a sensitivity of their subjects that is as questioning as it is knowing.